We've seen the Transporter beam things to sites without transporter equipment, and we've seen Transporter's retrieve things from sites without Transporter equipment. Say Scotty wanted to beam something from point A on a planet to point C, is it demonstrated somewhere in Star Trek canon that the item from point A must be routed through point B, the Transporter room, or can the item be beamed from A to C and and skip materializing it at point B? There's no need to use Transporter Room. In Star Trek: The Next Generation episode Justice (S01E08), Picard saw an urgency to get a woman out of the ship, so he put his badge on the woman and ordered transporter room to beam her down to the planet. And, transporter room successfully beamed her down to the planet despite she wasn't in transporter room. And, she didn't get materialize in the transporter room (yes, her particles would have gone through transporter room, but it's irrelevant to the question). The transporter converts the object at point A to a matter stream then into a pattern buffer (inside the transporter mechanism point B). Only then can it be transmitted again from the buffer to point C. There would be no need to first re-materialize the object at point B. The matter stream consisted of the stream of sub-atomic particles that resulted from the dematerialization of a transport subject. The stream was relocated from the original site of the subject, passed through the pattern buffer, transferred as an energy beam, and rematerialized into its original form again at its destination (often a transporter platform)°. 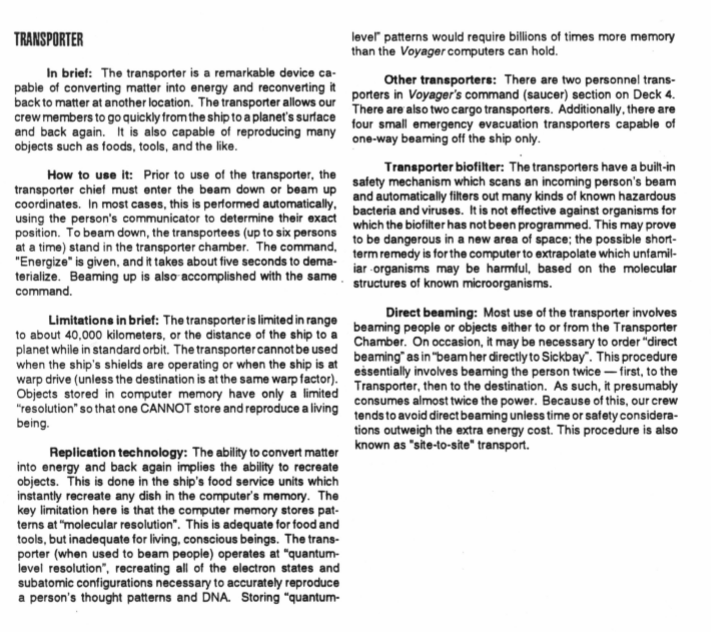 The pattern buffer was a key component of transporter systems. The buffer was used to temporarily store the matter stream following dematerialization, but prior to sending the stream to its target. This was done because of the relative motion of transporter and target. By temporarily storing the matter stream, the Doppler compensators had enough time to adjust the targeting scanners¹. See the section on Direct Beaming. Not the answer you're looking for? Browse other questions tagged star-trek star-trek-transporter plot-device or ask your own question. Did Sybok have any means of preventing a ship from beaming out the hostages on Nimbus III?